Avomeen Blog: The Chemistry of Hot Sauce - Addicted to Flavor or Endorphins? The Chemistry of Hot Sauce - Addicted to Flavor or Endorphins? 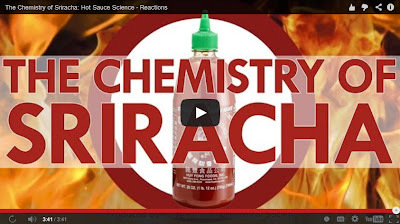 The American Chemical Society's Reactions group just released a new Everyday Chemistry video about the addictive hot sauce Sriracha. While consumers and retailers alike know that the hot sauce is flying off of store shelves, how many know that its chemical properties are as much to credit as the sauce's recipe? Capsaicin is the chemical cause of the body and brain's reaction to this spicy condiment and does more than just ignite your taste buds. Watch the video and read NPR's blog on the chemistry behind the sauce that is deemed "good on everything". To learn about flavor analysis and food testing visit our food and beverage testing page.